Nearly 40 years after the U.S. flag was planted on the moon, a global rush to the final frontier has some ponderingproperty rights out there. India, Japanand Chinaare now circling the moon with their respective spacecraft ? to be joined nextyear by NASA's Lunar Reconnaissance Orbiter. Then there's the GoogleLunar X Prize, a $30 million competition for the first privately fundedteam to send a robot to the moon, travel some 1,640 feet (500 meters) andtransmit video, images and data back to Earth. The legal profession sees a brief inthe making. Laws tend to build on precedent.Since there's little precedent for lunarlaws, some look to the sea for suggestions. That is, the use of ocean floorminerals beyond the limits of national jurisdiction. Such valuable resourcesare designated by some as a Common Heritage of mankind, not subject to nationalappropriation. Could the Common Heritage conceptwork as the basis for a Moon Treaty? Virgiliu Pop is a researchspecialist at the Romanian Space Agency. He has for years been keeping a legaleye on the area of space property rights, and his new book, "Who Owns theMoon? - Extraterrestrial Aspects of Land and Mineral Resources Ownership" (Springer,2008) was published this month. Pop has been delving into what hasshaped the law of extraterrestrial real estate, and the norms which expressthis law. And in his view, the norms and rules regarding property rights in thecelestial realm are rather limited, even failing to define basic concepts suchas what is a celestial body. Pop favors property rights overgroup hugs. 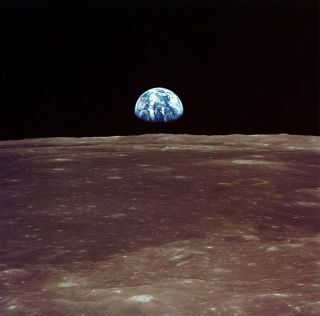 "Despite the noble ideals ofequity and care for the have-nots, the Common Heritage paradigm of the MoonTreaty has more faults than merits," Pop told SPACE.com. "A refutation of the CommonHeritage principle does not mean, however, that the developing world will, orshould, be left behind in the space era," he said. "China, India and Brazil are living proofs that a developing country can, through its own effort,join the spacefaring club. Instead of freeloading on the efforts of the older spacefarers,the have-nots should pool their meager financial resources into a common spaceagency or into regional ones, and proceed at exploiting the riches of outerspace for themselves." The Frontier Paradigm, on the otherhand, has proven its worth on our planet, Pop adds, and it most likely will doso in the extraterrestrial realms. "Homesteading is likely totransform the lunar desert in the same manner as it transformed the 19thCentury United States," he said. "Space is indeed a new frontiercalling for individualism rather than collectivism, and its challenges need tobe addressed with a legal regime favorable to property rights." Much remains to be discussed andperhaps decided upon by various nations, of course, as space law evolves overtime. "Property rights are a usefulengine and, in all likelihood, a precondition for pushing forward thedevelopment of the extraterrestrial realms," he said. "Securing propertyrights would be more beneficial to humankind, compared to the alternative ofkeeping the extraterrestrial realms undeveloped." Pop feels that the new trends in theprivatization of space endeavors and the planned return of humans to the moon willshift the subject of property rights in outer space "from the field ofByzantine discussions into the sphere of the concrete." Beyond the moon, Pop also ponders inhis book whether asteroids and comets are immovable land-like territorialextensions that cannot be legally appropriated. Or, are they "floatingmovable goods," capable of being captured and reduced into privateownership? Pop offers up a suggested rallyingcry for spacefarers: "Countries of the world unite ? you have nothing tolose but the chains of gravity?the skies are open." Leonard David has been reporting onthe space industry for more than four decades. He is past editor-in-chief ofthe National Space Society's Ad Astra and Space World magazines and has writtenfor SPACE.com since 1999.